There is no easy way to reach Braydon Crag. It stands more than three crow-flown miles from the nearest public road at Cocklawfoot, north of the border, and from there it would certainly make a fine, lung-bursting walk. However, I am contrary by nature, so I had decided on the even longer Harthope Valley approach and, as I trundled towards the neighbouring Lambden Valley for the start of an unrelenting one mile climb to this outstanding rocky outcrop, I was already anticipating a long day in the hills. 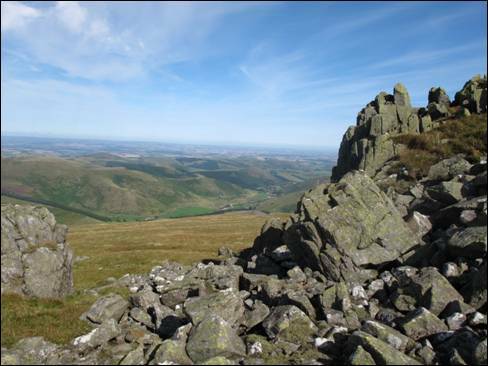 The impressive Braydon Crag stands on the north-west corner of the mighty Cheviot and is the place where, during a late afternoon blizzard in December 1944, a U.S. Army Air Force B17 Flying Fortress crashed killing two members of the nine man crew. Before the on board bombs exploded two local shepherds, guided by sheepdog Sheila, found four of the crew sheltering in a peat hole whilst a further three crew members found their own way off the hill to Mounthooly in the College Valley. As a result of their actions the shepherds subsequently received the British Empire Medal whilst Sheila received the Dickin Medal, the animal equivalent of the Victoria Cross. But the story does not quite end there. On the 20th September 2005, George Kyle, the pilot of the B17, died in his home town of Fort Lauderdale at the age of 82 years. Before he passed away George had expressed the wish that his ashes be scattered across the site of the crash. So, on the 4th October 2006, George`s daughter, his long term friend and companion and the son of the B17 co-pilot were taken by helicopter to Braydon Crag and his final wish was granted. Finally, I crested the long, grass-carpeted slope which had guided me from the remote, whitewashed holiday cottage of Dunsdale to this tightly-packed cluster of up-stretched rocks high above the junction of the College and Lambden Valleys. At last I had reached Braydon Crag, some 717 metres above sea level and occupying one of the most dramatic positions in the Cheviot Hills. I clambered to the highest slab of rock and examined every angle of the 360 degree panorama. To the south, less than 200 metres beyond the peat line, I caught sight of the silver-grey remains of the B17 bomber and I decided to pay a flying visit before I continued on my walk. Minutes later, as I stood beside what little remained of that once-magnificent flying machine, I could only imagine what it must have been like for those young American airmen on that raw December day marooned in that inhospitable landscape of endless weather-worn peat hags. A cold shiver ran down my spine as I turned towards West Hill and possibly the most awe-inspiring view in Northumberland. I was on my way again leaving whatever ghosts that inhabit Braydon Crag to their endless wanderings.